The task of staking out for the NACA a defensible field of activity in the postwar world of American aeronautics fell largely to Jerome Hunsaker in his role as chairman of the Committee. The task of working that field fell largely to Hugh Dryden, who succeeded the failing George Lewis in 1947. Dryden's job fell into four major categories: first, to institute organizational and procedural reforms to adapt the agency more closely to his own style of management; second, to clear up unfinished business from World War II; third, to respond to industry demands, some of which he was independently in sympathy with; finally, to identify new areas of research into which the NACA could and should move. Some of these tasks were already under way when he arrived. Some he initiated. All came to bear the stamp of his administration. Hugh Latimer Dryden wrote his first paper on aeronautics in 1910, when he was 12 years old and the airplane was not yet 7. In "The Advantages of an Airship over an Airplane," be argued that the former was better suited to commerce, the latter to sport, a conclusion that his teacher prophetically found "Illogical" though at the time it was a thoroughly sound judgment.1 He got an F on the paper, making all the rest of his 55 years a refutation of his maiden essay on aviation. One of Dryden's instructors at Hopkins, physics professor Joseph S. Ames, recommended the newly fledged physicist to the National Bureau of Standards as "the brightest young man he had ever had, without exception. "3 At the Bureau, Dryden was tutored by Ames and allowed to conduct experiments in the wind tunnel on his own time, completing the requirement for the Ph.D. in less than a year while holding down a fulltime job. In 1919 he took his doctorate in physics and mathematics at the age of 20, the youngest doctor ever at Johns Hopkins. His dissertation on "Air Forces on Circular Cylinders" stimulated sophisticated research in the field for more than a decade. Dryden's career at the National Bureau of Standards spanned almost 30 years, during which he specialized in research on wind-tunnel turbulence and boundary layer, contributed to other fields of research, worked closely with the NACA, and published often in NACA reports.4 During World War II his career broadened dramatically and drew him into an ever widening range of; activities. He served on the National Defense Research Committee, and personally administered a guided-missile development program in cooperation with the navy. He was deputy to von Karman in the Scientific Advisory Group's mission to Europe and became a charter member of the Air Force Scientific Advisory Board. 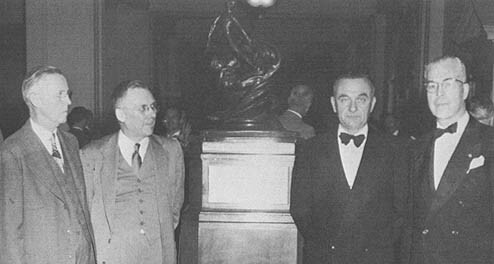 In 1944 Dryden was elected to the National Academy of Sciences, where he would later head the engineering section and serve as home secretary for the last decade of his life. At the National Bureau of Standards he became assistant director in January 1946 and associate director a few months later. The revisions began with a formal delineation of Dryden's authority and responsibilities and his relationship to John Victory. The roles adopted by Lewis and Victory over the years were not entirely to Dryden's liking; he preferred an arrangement more in keeping with the one he had known at the National Bureau of Standards. Outside the Committee, however, the amendment created confusion as to who headed the agency, the director of research or the secretary. An executive pay bill introduced in 1949 provided a pay increase for top civil-service executives. Though the NACA was at first not included in this bill, Hunsaker fought with the Bureau of the Budget and won the inclusion of one NACA position. That put a  premium on establishing officially who was head of the agency. Clearly it was Dryden, and just as clearly the NACA regulations needed amendment to settle the issue formally. On 7 February 1949, Hunsaker submitted to President Truman a set of proposed amendments to the NACA Rules and Regulations. The changes in article 2 elevated Victory to the position of executive secretary and created a new post of associate director for research, to which John Crowley acceded after having served the interregnum between Lewis and Dryden. Most important, the new rules designated Dryden "director" instead of "director of research" and provided that he would "be the head of the agency in all matters except those which by law or regulation require action by the Chairman." This would end the division of labor worked out unofficially by Lewis and Victory, with the director of research managing the technical business of the agency and the secretary handling the administration. Now there would be a single head of the agency, with one technical and one administrative deputy. A specialized scientific agency like the NACA requires somewhere in the top command someone whose qualifications extend beyond the scientific fields covered by the agency, and while some members of the main committee meet this need in part, I believe that it would be desirable if either the head or the assistant head of the agency be a nontechnical person. The Research and Development Board is learning the hard way that the management of a scientific research and development program does not require scientists, but administrators and it is well known that it is very rarely that one finds scientists who are also administrators. In my opinion the Bureau of the Budget would be making a serious mistake to base any action on the assumption that scientific agencies should in all cases be headed by scientists. Specifically, I think there is no merit in the argument that the assistant head of NACA should necessarily be a scientist. After 1949, however, Dryden was in name and in fact the director of the NACA,12 working comfortably with Jerome Hunsaker, who seemed happy to hand over some of his wartime responsibilities to this trusted colleague. Though Hunsaker was nominally an engineer running an engineering department in an engineering school, he, was a scientist at heart, having more in common with Dryden than he ever had with Lewis.13 Dryden and Hunsaker held earned doctorates; shared membership in the National Academy of Sciences, the American Philosophical Society, the American Physical Society, and other professional organizations; published in scholarly journals; and viewed the NACA with a detachment and perspective that Lewis perforce could not attain. Perhaps more than anything, they wanted to see the NACA more open and participatory than it had been under the Lewis regime. the new subcommittee member receives no information regarding the membership or functions of the parent committee to which his subcommittee reports, or any inkling of the nature of other NACA committees. And if it were not for the fortunate circumstance that the membership of the main Committee appears at the top of the NACA letterhead, he would not even be advised of that important information. 1. Review research in progress by the NACA and by other agencies. 2. Recommend problems that should be investigated by the NACA or by other agencies. 3. Assist in the formulation and coordination of programs for research by the NACA and by other agencies. 4. Serve as a medium for the interchange of information regarding investigations and developments in progress or proposed. Revival of the annual industry conferences after World War II posed a similar problem, one in which George Lewis was more amenable to change. 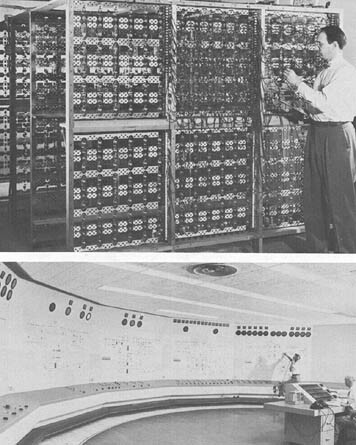 In the 1940s and 1950s, there were several laboratories to visit, literally hundreds of specialists from industry, academia, and  government to accommodate, and a NACA research program to explain that simply could not be summarized in any digestible way. "It is not like the old days when we could have alt the group down' in one day," lamented George Lewis in 1947,19 yet something like the old conferences seemed a useful, even indispensable, part of the NACA tradition. The solution was to have a series of rotating inspections at the various laboratories, modeled upon the military inspection routine adopted just before World War II but retaining the old NACA tradition of carefully orchestrated and exhaustively rehearsed presentations by the working engineers. The Langley and Ames laboratories alternated as conference hosts every other year. An inspection was held every 7 year at the Cleveland installation which became the Flight Propulsion Research Laboratory in 1947 and the Lewis Flight Propulsion Laboratory in 1948, when the former director of aeronautical research died. For his part Dryden supervised the numerous technical conferences held each year on specific topics with a limited number of informed guests. These smaller meetings took over the function of information exchange once performed by the prewar industry conference. Stressing content more than style, they were less spectacular but no less effective. One set of conferences was for substance, one for show. Both served the purposes of the Committee. Not all the Committee's business could await the arrival of Dryden and the subsequent reordering of the staff hierarchy. As World War II drew to a close, the NACA had been in military harness for more than half a decade. The transition to peacetime operations called for fundamental policy decisions by Lewis and John Crowley. Though Dryden would oversee (and in some instances modify) these decisions, he had always to cope with an inertia of several years' growth. Chief among these transitional issues were the return to fundamental research, the declassification of wartime reports, the reestablishment of the Committee's European Office, and the clarification of the postwar draft status of NACA personnel. Far and away the most serious of these issues, at least to the leaders of the NACA, was the need to return to fundamental research. 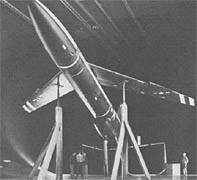 The most common complaint in the immediate postwar years arose from the lamentable shortage of fundamental data caused by the NACA's wartime preoccupation with cleanup and testing of military prototypes.22 Politics motivated this plea in part, for the NACA was anxious to reestablish its claim to virtually exclusive dominance in fundamental aeronautical research. In part the claim was justified by the legitimate requests from industry for answers to new and basic questions about high-speed flight. Still the call for fundamental research echoing from the NACA had about it the ring of dogmatism. For one thing, the term itself was a study in compromise, more suited to blurring boundaries between research functions than clarifying them. Nor was it entirely clear to everyone within the NACA that it was in the Committee's best interests to return to this role, even if it were possible. First of all, much development work had to be done in NACA tunnels. As had always been the case, some NACA tunnels had unique capabilities unavailable elsewhere in the United States. 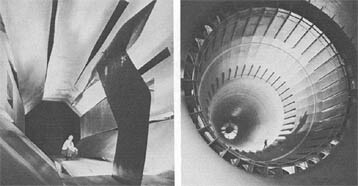 When industry or the military services needed a 40- by 80-foot full-scale tunnel, the NACA had to accommodate the research, fundamental or not. Furthermore, the industry and the services had grown accustomed during the war to consulting the NACA on an unprecedented range of development problems from cleanup and testing to problem-solving and redesign; always more interested in getting the current prototype up to specifications than in solving problems of the future, they were reluctant to let the NACA abandon the development services they had come to rely on. While the complaints of disgruntled employees cannot be taken as the measure of an institution, this man's observations warrant consideration. They corresponded to Hartman's, had the ring of truth, and touched a resonant chord at the Bureau of, the Budget. Willis Shapley, to whom the man told his tale, reported that his "description of the situation at Langley Field corresponds very closely to the account" he and other members of the BoB staff had heard the previous fall from another source. Whether or not this perception of the NACA was accurate, it was shared by some within the NACA staff, and more importantly by some outsiders close to Committee affairs and influential in determining the Committee's fate. The final postwar conversion problem to face the NACA was the draft status of its personnel. During the war Victory had negotiated a series of agreements with the military and the Selective Service to keep critical NACA personnel on the job. With the termination of the war, these agreements expired and many on the staff became subject to the draft. Again it was Victory who took the lead in working out a new set of compromises 33 that got the Committee by the immediate postwar crunch with little trouble. The greater significance of the draft question, however, was its relationship to the u coming battle over recruitment, retention, and pay of qualified NACA employees. In this area Victory was to make perhaps his greatest contribution, both to the NACA and to the country at large. This is properly a story of the 1950s and will therefore be treated at length in chapter 11. But it should be kept in mind that the postwar crisis over draft eligibility links Victory's later work on retention of qualified civil servants with his wartime struggles for draft exemption, where the foundation for the entire policy was laid. Industry's other principal demand after World War II was for better dissemination of NACA research results, getting more information out sooner to a wider audience. Really this lay behind industry  demands for greater "representation" on the technical committees, because there was no better way to get the ',latest NACA information than to be on the committee overseeing the NACA program. On this issue, however, the NACA held firm under both Lewis and Dryden. Membership on NACA technical committees was an individual's service to the country, not an NACA service to industry. It was a means whereby the NACA could get the best technical advice available, not a mechanism whereby the industry could stay apprised of technical developments in the NACA and elsewhere. Though the NACA did distribute its memberships as equitably as its own needs for expertise and talent would allow, it never satisfied industry demands for information. So the Committee was forced to disseminate information to industry through other channels. The Office of Publications consisted of the old editorial staff, one of the more controversial groups at headquarters. NACA reports were accorded almost biblical credence by aeronautical engineers around the world, a source of great pride to Lewis and the entire NACA staff. Behind this accomplishment lay an exhaustive and exhausting editing process, involving layers of review and revision at the laboratory and at headquarters before any NACA report saw the light of day. Reliability crowned this process; undue caution and delay were its hazards. The philosophy at work was the engineer's, one greatly at odds with the scientist's that Hugh Dryden brought to the NACA in 1947. The engineer wants a solid, dependable, careful report that will last through  time. The scientist wants his latest results in print as soon as possible, believing that the free exchange of ideas, even the disproving of one idea by another, will advance the state of knowledge. This Year's report may be outdated or even proven wrong by next year's, but if it advances knowledge it will serve its purpose. Of course, the engineer wants to get into print as soon as possible to establish the priority of his work, and the scientist wants his research to be as sound and verifiable as possible, but there is nonetheless a real and distinguishable difference in their attitude toward publication. One suspects there was more here than merely staying abreast of NACA work. A minor source of controversy for years was the issue of negative results. If the NACA ran a series of tests on a new idea or device and found it wanting, should it publish the results? This was largely a question of institutional self-confidence and security. If one is sure of his position and his worth, he won't hesitate to admit his mistakes, especially if he thinks those mistakes were reasonable guesses in a complex and confusing field, and if he thinks his errant pursuits might prevent others from walking the same dead-end path. The publication of negative results remained a problem for the Committee. In 1950, for example, headquarters advised the Ames laboratory that "the brief reporting of unsuccessful attempts is considered of some value in itself in informing and warning the readers," but went on to suggest that the treatment of an unsuccessful research strategy in a proposed technical note was "overly detailed and detracted from the presentation of the more successful method. "42 No industry action could keep this sort of thing from going on within the NACA, but the annual list of projects would at least tell the industry whether the NACA had buried a whole research project. The list of projects also helped to substitute for the loss of the old industry conferences. Industry representatives knew it was no longer possible to be briefed on all the NACA projects in a single day at Langley, or even in a single visit to all the laboratories, and they welcomed the specific conferences on isolated topics that provided the detailed exchange of information they used to get at Langley. The list of projects filled the gap between the specialized meetings and the new "inspections" and showed where the specific topics fit into the overall NACA research program. 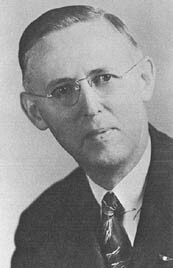 The fourth major problem confronting Hugh Dryden when he took over the NACA in 1947 was choosing new fields of research for the Committee. Many new projects emerged in these years, from aircraft fire prevention to the aerodynamics of internal flow (the airflow within the ducts and turbines needed to support jet propulsion). But three areas overshadowed the others in urgency, importance, and glamor: high-speed flight, missiles and rockets, and nuclear power for aircraft propulsion. Through his technical-committee memberships during the war, Dryden had been instrumental in launching all three. After joining the NACA, he guided them through the politics that came to surround them, with fateful consequences for both himself and the NACA. The most obvious solution was the research aircraft program, a joint venture between the NACA, the military services, and industry to develop and fly supersonic aircraft. The story of this unprecedented cooperative program and the NACA role within it has been told in Richard Hallion's Supersonic Flight 46 and need not be repeated here. Three features of the program, however, deserve mention for their influence on NACA history. ....talent and expertise in areas for which it was not formally responsible. Industry could speak to wing flutter theory just as readily as the military could address fabrication techniques, and the NACA had at least one resident expert on everything. So successful was this industry-military-NACA collaboration that it succeeded in "breaking the sound barrier" within 2.5 years of letting the first contract for a supersonic aircraft. ....unpredictable and the headquarters is constantly on call to justify the agency's existence. The research-aircraft program took on a life of its own and overshadowed its original purpose. At first it was just an expedient for conducting high-speed research. 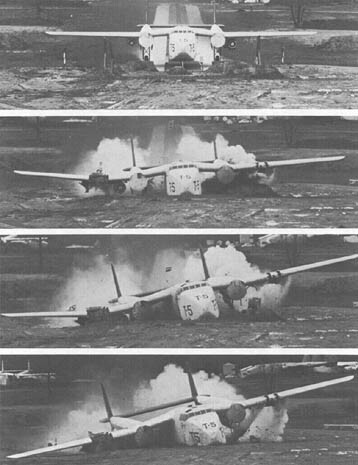 Other methods used by the NACA in the late 1940s, while less spectacular, produced equally useful data. 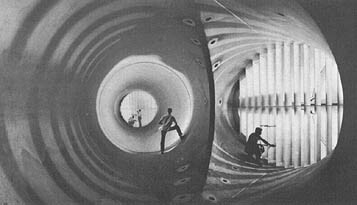 Since the wind tunnel was at the heart of the NACA tradition, the  Committee devoted substantial amounts of money and manpower to improving wind tunnel design, especially in the anomalous transonic region just below and above the speed of sound where previous aerodynamic research proved inadequate. In a normal wind tunnel, proximity of the tunnel walls distorts the flow over the model from what it would be in the open, and this undesirable effect increases drastically at transonic speeds. The problem at these speeds was to devise a new kind of tunnel that would reduce this effect to acceptable limits. John Stack's group at Langley took the lead in this campaign, as it had in the research-aircraft program, with equally stunning results. This period also saw much low-speed, conventional testing of high-speed models and airfoils, for one major problem was how to design  supersonic aircraft that could also maintain stability and control at speeds low enough for safe and practical landing. Stability and control were in fact the main problems of high-speed flight,50 but they were now critical not only in the old regime but also in new areas where the rules were not the same. As the last new facility the NACA was to obtain, Wallops Island closed two chapters of the Committee's history. First, Wallops gave the  NACA the other ingredient of the National Supersonic Research Center that had been lost in the compromise unitary plan. The original NACA proposal had called for a missile-launch facility; with Wallops and Muroc and the tunnels built at the existing laboratories, the Committee got everything it wanted in its proposal - every thing, that is, except the new center and a monopoly on supersonic research. Second, in the decade from 1938 to 1948 four new research facilities had been created out of nuclei drawn from LMAL. Langley had served as the mother laboratory from which all others were born, a pattern that was to repeat itself, though not without exception, when the NACA became NASA. Of course, supersonic flight, missiles and rockets, and nuclear propulsion for aircraft were only the most dramatic of the new fields of research into which the NACA moved in the late 1940s, but the Committee's record in these areas reveals the general drift of events. The NACA was clearly losing ground in the jockeying for position behind the scenes, even though the public image was one of achievement and triumph. Within six years after the end of World War II, the Committee had gone a long way toward restoring its reputation and dimming the memories of how it had been bested by Germany during the war. In those six years it won three of the five Collier trophies that it was to receive in its entire history, and the achievements that won those awards reflect the transition the NACA was going through. 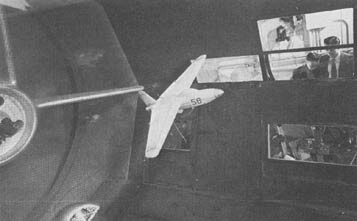 In 1951 John Stack shared the Collier: trophy again, this time with his associates at Langley, for developing a transonic wind tunnel in which wall effects had been reduced enough to yield reliable data in the most troublesome of speed ranges. Although other researchers had despaired of achieving valid wind-tunnel results in the transonic range, Stack and his colleagues had persevered to a success emulated and copied around the world. Once more it was fresh, brilliant, daring research that was winning public accolades for the Committee in contrast to the more mundane achievements of icing research, even though the latter might benefit a larger group and be more widely appreciated by knowledgeable people. 1. Richard K. Smith, compared, The Hugh L. Dryden Papers, 1898-1965: A Preliminary Catalogue of the Basic Collection (Baltimore: Milton S. Eisenhower Library, Johns Hopkins University, 1974), pp. 19-20, 38. 2. Biographical information is drawn from Smith, Dryden Papers, pp. 19-33, and Jerome C. Hunsaker and Robert C. Seamans, Jr., Hugh Latimer Dryden, 1898 1965: A Biographical Memoir (New York: Columbia University Press, 1969), reprinted from National Academy of Sciences, Biographical Memoirs, vol. 40. 3. This quotation appears in Smith, Dryden Papers, p. 20, without provenance. 4. In the 1920s and 1930s Dryden was author or coauthor of 14 NACA technical reports, the most formal and most prestigious of the NACA report series. See NACA, Index of NACA Technical Publications, 1915-1949 (Washington: NACA, 1949), pp. 5, 8, 10, 17, 20, 66, 218, 553, and 566. 5. Johns Hopkins University, Milton Eisenhower Library, Hugh L. Dryden papers, subject files, box 3, 1947, June July August. Correspondence re Hugh L. Dryden's Appointment as Director of NACA, esp. Hunsaker to Dryden, 30 June 1946. 6. Dryden, "Report of Director of Aeronautical Research Submitted to the National Advisory Committee for Aeronautics at its Annual Meeting, October 23, 1947, 11 attached to minutes of the meeting. 7. See appendix A. In 1945 Hunsaker went a step further and gave Victory a blanket authorization to act as head of the agency. He wrote: "As Executive Secretary of the National Advisory Committee for Aeronautics, you are authorized and directed, under provision of Article 11 Section IV of the Rules and Regulations for the Conduct of the Work of the National Advisory Committee for Aeronautics, with amendments approved by the President to October 23, 1944, to exercise the functions required by law to be performed by a head of department or agency. "There was some question as to whether or not this was legal, let alone advisable; see W.M. Shea, draft memo for [E.H.] Chamberlain," Heads of Departments Delegation of Authority, undated. Shea apparently worked in the Office of the Comptroller General, where Victory had sent a copy of Hunsaker's letter on 14 Nov. 1945. 8. Hunsaker night letter to James E. Webb, director of BoB, 13 Dec. 1948, in 62 A 35 (41), 010 legislation general 1942-1948; Victory to distribution, 19 May 1949, in 65 A 953 (2), interoffice memos, 1950; appendix A; Hunsaker to Elmer B. Staats, 21 Feb. 1949. The quote is from C.B. Stauffacher (Arnold Miles, Irving Lewis) to Staats, "Amendments to NACA Regulations," 5 Apr. 1949, which actually says "new program responsibilities," clearly a slip of the pen in light of the context. 9. Stauffacher to Staats, "Amendments to NACA Regulations," and I.J. Lewis to Arnold Miles, "Proposed Amendments to NACA Regulations," 21 Feb. 1949. This latter memo argued that the NACA proposal "would not provide for an integrated organization," a continuing criticism in some quarters at BoB. 11. The postwar change in Victory can be traced most clearly through his personal papers in the Special Collections Branch of the U.S. Air Force Academy, Colorado Springs, which contain copies of his history drafts and the notes he used in numerous speaking engagements in the 1940s and 1950s. 12. The heads of the NACA laboratories were assigned the uniform title "director" in July 1947, two months before Dryden succeeded Lewis but one week after he learned of his selection. Perhaps one reason that the title had not been used before Dryden's time was the opposition of Vannevar Bush. He said in 1939, "I don't like 'director.' It implies line & this is staff." Bush to Lewis, 4 Sept. 1939, in NA RG 255, entry 3, box 4, Bush, 1938 1940. A curious footnote to the entire story is that, as soon as Dryden was appointed director by Hunsaker's letter to the Executive Committee of 19 day 1949, he authorized Victory to act as head of the agency. This was the same power Hunsaker had previously confer red on Victory; the difference was that it now came from the director. See Victory to Hunsaker. I Feb. 1949, and General Administrative Directive 1-49, 19 May 1949, in 62 A 35 (52), 300.1 1948-1949. 13. On Dryden, see note 2; on Hunsaker, see the biographical information in the Hunsaker papers, National Air and Space Museum, Smithsonian Institution, Washington, D.C.
14. See, for example, M.B. Ames, Jr., to Lewis, "Proposed reorganization of NACA Committees on Aircraft Structures and Materials," 5 Jan. 1943; H.C. Chandler, Jr., H.M. Conway, and W.J. McCann memo, "Recommended reorganization of' Committee on Aircraft Structures and Committee on Materials," 26 May 1943; Thomas Neill to Lewis, "Membership for coming year on: Committee on Power Plants for Aircraft, Subcommittee on Heat Exchangers, Subcommittee on Supercharger Compressors," 22 Dec. 1943; Neill to Lewis, "Membership for coming year, 1944, on the Committee on Power Plants for Aircraft," 29 Dec. 1943; McCann memo, "Reappointment of NACA Special Subcommittee on Heat Resisting Alloys," 27 Sept. 1944; Addison M. Rothrock to executive engineer, AERL, 16 March 1943, in 62 A 35 (9), 123.3, research; Rothrock to Lewis, 1 Aug. 1944, in 59 A 2112 (26), 112.11, 1940-1951; Rothrock to Lewis, 9 Aug. 1946, in 59 A 2112 (12), 110 subcommittees (gen) 1945-1946; R.E. Littell to director of aeronautical research, 17 Apr. 1946, in 62 A 35 (2), 122.3; and John G. Lee to Hunsaker, 26 Sept. 1946, in 60 A 635 (12), 110. 1, Lee, John G.
15. Harrison C. Chandler, Jr., to Lewis and Crowley, "Relations with NACA Technical Committees and Subcommittees," 2 Dec. 1946. 17. F.W.S. Locke to NACA, 30 Oct. 1951. 18. At least one member was as concerned about the Main Committee's effectiveness as others were about the technical committees and subcommittees. E.U. Condon of the National Bureau of Standards wrote Hunsaker in 1946: "Although I have been a member of NACA for about a year it is not yet clear to me just what degree of responsibility for the operations we are supposed to have." He asked for more information, implying that he wanted to make his own judgments instead of depending on presentations made by the staff for the Main Committee's approval. Hunsaker provided him with the information he requested, but seems not to have changed the policies surrounding the Main Committee as Dryden was doing with the technical committees. Condon to Hunsaker, 28 Oct. 1946; Hunsaker to Condon, n.d., filed at NACA on 2 Dec. 1946. 19. Lewis to James H. Doolittle, 10 June 1947, in NA RG 25-5, entry 3, box 6, Doolittle, 1946. [Blank in the original]. 20. Hugh L. Dryden, "The Responsibilities of Research Directors," a talk delivered to the Institute on Administration of Scientific Research and Development, American University, Washington, 7 June 1949, p. 13. The next and last sentence f the quoted paragraph is: "In this extreme case and in others, the sales effort may be merely a clear and excellent presentation of a scientific paper," revealing clearly where Dryden's deference's lay. 21. Appendix H provides an excellent insight into headquarters thinking about inspections at this period, and indeed throughout most of the Committee's history. Abbott's comment that "Erroneous impressions may.....result from talks that re strictly accurate" is probably no more sinister than Saki's observation that "a little inaccuracy sometimes saves a ton of explanation." Now the reserve of knowledge available when we entered the war, and without which victory would have been greatly delayed, has been exhausted. 23. Edwin Hartman, "Comments on Aeronautical Research Policy," 28 Aug. 1944, in 62 A 35 (.73), postwar research policy, Sept. Dec. 1944. 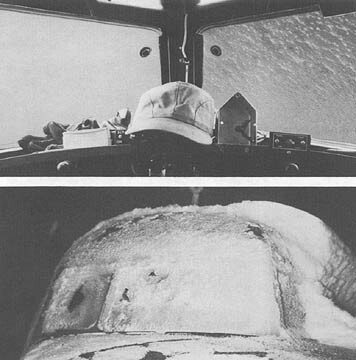 The story of icing research appears in George W. Gray, Frontiers of Flight: The Story of NACA Research (New York: Alfred A. Knopf, 1948), chap. 14. 24. Ira H. Abbott to Monte D. Wright, 30 April 1980, encl., p. 17; John V. Becker to Monte D. Wright, 30 May 1980, encl., p. 350. 26. Willis H. Shapley to [Roger) Bounds, BOB, "Visit Of MT. Miller of the NACA Langley Field Laboratory," 11 July 1945. 27. Victory wrote to Hunsaker on 11 Nov. 1948 that the head of defense estimates at BOB had told him that the NACA makes the best budget presentations of any government agency (59 A 2112 (11), 31 1, Hunsaker, 1948 1952). The "favorite project" of another man in the same branch, however, was "reducing the size, bulk, and weight of the NACA budget presentation" (Shapley to Veatch, "NACA 1950 Budget Presentation," 13 Aug. 1948). In a pile of documents as large as that which the NACA annually presented to BOB, it was difficult to separate comprehensive justifications from a calculated avalanche of detail. Throughout the 1940s, the NACA budget rose every year save 1946. See appendix C.
From the trend of the discussions at the meeting, it was readily evident that the NACA should take immediate steps to declassify and give a rather wide distribution to such information as may now be classified. It was quite obvious that pressure would be brought to bear to see that steps were taken in this direction. Smull to Lewis, "Conference on the declassification and dissemination of technical information at the Department of Commerce on September 5, 1945," 5 Sept. 1945. 30. See, for example, LMAL to NACA, 27 Apr. 1948, in 58 A 454 (1), special file, RA 35 1, Jan.-Sept. 1948. 31. Minutes of Executive Committee meetings, 15 Aug. 1946 and 24 Nov. 1947; minutes of NACA meeting, 24 Oct. 1946. The entire story can be traced in 62 A 35 (53), 300.1, 1940-1950. 32. See appendix A, and minutes of Executive Committee meeting, 21 Sept. 1950. 33. Minutes of Executive Committee meeting, 6 June 1946, pp. 13-14. 34. See appendix B, and pp. 163-164. 36. The Office of Aeronautical Intelligence was expected to deal only with published material. Work in progress, especially at universities, remained the responsibility of the Coordination Office. The complexity of the task and the difficulty 4 staying abreast of aeronautical research is suggested in: W.R. Sears to Hunsaker, 30 Mar. ; Hunsaker to Dryden, 5 Apr. ; Dryden to Hunsaker, 13 Apr. ; and Dryden to Sears, 13 Apr. 1948. 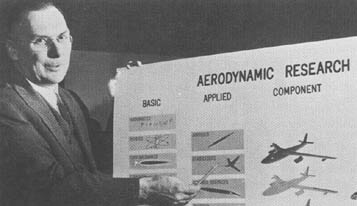 Sears, a member of the NACA Committee on Aerodynamics, had attempted to poll all leading academic aeronautical research institutions to prepare a summary of research in progress; Hunsaker and Dryden considered this impractical. 37. See appendix G, and Abbott to Wright, 30 April 1980, encl., p. 18. It is appreciated that the ideal form of an NA A publication is a scientific research report in which a thorough and complete analysis of the problem at hand is presented. It is also appreciated that in aerodynamic tests, large amounts of data are obtained which would be impractical to represent in published reports, and consequently these data should be analyzed by the laboratory staff and the results of the analyses only could be presented in the interest of keeping reports from being too voluminous. The last sentence of Littell's memo demonstrates that the NACA was often damned if it did and damned if it did not. While Warner was asking for more analysis, many engineers in industry were asking that the NACA not fair its curves d at it present the point results of its tests on graphs rather than averaging them out to curves approximating specific findings. 39. Minutes of Executive Committee meeting, 19 May 1949, pp. 11-12. 40. The entire story can be traced in 65 A 953 (36), A 34, 1957. 41. Lewis to C.F. Taylor, 3 Nov. 1934, in 57 A 415 (2), 1-5A, 1933- ; David Baker to John Foster, Jr., 4 Dec. 1946, in 62 A 35 (68), 317, 1946-1947. Hunsaker's comment appears in Senate Special Committee Investigating the National Defense Program, Investigation of the National Defense Program, hearings on S. Res. 55, 79/2, 1946, part 33, p. 16845. Interestingly, the senators seem to have been well primed by earlier industry testimony. One replied "Why not?" Another suggested that it "would be help to research men in the Army Air Forces and in industry who might get a similar idea years from today and go through the same rigmarole and come up with another 'dead cat' Hunsaker replied that "engineers and professional men are not in the habit of writing papers about false ideas unless they are very important ideas held by a lot of people, and then sometimes the controversy is worth publication." When asked, he stated his conviction that the NACA was publishing the papers that merited publication. 42. NACA to Ames, 7 Nov. 1950, in 56 A 35 (4), TN-2288. On proprietary information, see the policy reprinted in appendix H, originally adopted because of a dispute with one of the engine manufactures and later expanded to include all NACA research. See minutes of Executive Committee meeting, 16 Dec. 1949, p. 6. 45. Indicative of the emphasis then being put on high speed flight was the 4 Oct. 1945 letter to George Lewis from Brig. Gen. L.C. Craigie, chief of the Engineering Div. at Wright Field, which said in part: "This command feels that the fundamental problems of high speed flight are of such magnitude and importance to this nation that the pertinent facilities of the NACA should not be diverted to any other purposes." 46. Richard Hallion, Supersonic Flight: The Story of the Bell X-1 and the Douglas D-558 (New York: Macmilllan, 1972). 47. Hallion, On the Frontier: Flight Research at Dryden, 1946-1981 (NASA SP-4303, in press). 1. At any given time period in which we were flying the research airplanes from the type 558-1 through the X-3, tactical airplane types were available which had better aerodynamic form and higher performance at reasonable altitudes than the research airplanes involved. For instance, wing thicknesses, wing sweep angles, and general aerodynamic design of the research airplanes were actually behind tactical aircraft designs by the time any research flights could be performed. 2. Our research airplanes have developed startling performance only by the use of rocket engines and flying essentially in a vacuum. Testing airplanes designed for transonic flight speeds at Mach numbers between 2 and 3 has proven, mainly, the bravery of the test pilots and the fact that when there is no drag, the rocket engine can propel even mediocre aerodynamic forms at high Mach numbers. 3. I am not aware of any aerodynamic or power plant improvements to air-burning engines that have resulted from our very expensive research airplane program. Our modern tactical airplanes have bee designed almost entirely on NACA and other wind tunnel data, plus certain rocket model tests. The flight expenditures for one type of research airplane was, roughly, one and one half million dollars per flight, with very little flight information obtained that is useful in future designs. Lack of suitable power plants and terrifically long development periods were responsible for such costs. 4. While a great deal of information has been de eloped on stability and control at high Mach numbers, this data has applied to aerodynamic forms not typical of airplanes actually designed for supersonic flight speeds. Johnson's criticisms must be discounted for professional jealousy and the "not-invented here" syndrome. Furthermore, the research aircraft program had begun in the second half of the 1940s, before the transonic wind tunnel was available to give researchers the mach I flight data they needed. 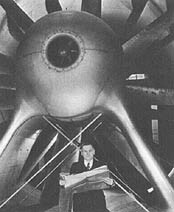 Johnson was nevertheless a giant in the field, and his objections, especially about the relative cost of the program, have not been addressed in print by the supporters of the research aircraft. Hallion paints this conflict in bolder colors in his Dryden book than in his earlier Supersonic Flight. The later volume relies heavily for this topic on interviews with old NACA hands still at Dryden center or in retirement, and it was perhaps from these men that Hallion derived his interpretation of what happened. The staffs a: all the laboratories liked to think of themselves as more knowledgeable than the headquarters staff, and they were not above using their positions near the work to get their own way. In this regard, Lewis was and always had been fighting a losing battle. The remarkable thing is how much and how long he kept control. That he lost out on this issue is further testimony to the growing complexity of aeronautics and the NACA program and to Lewis's own failing powers. 49. Gray, Frontiers of Flight, chap. 15. 50. Russell G. Robinson wrote to George Gray 28 Mar. 1948 that "the most important technical problem in aeronautics at this time is that of retaining control of the airplane through the speed range near the speed of sound." In 59 A 2112 (10) 1.00 (Gray) 1947. 1. To recommend most promising fields of research in support of naval and military development needs. 2. To propose specific research projects to the appropriate NACA technical subcommittees. 3. To exchange and evaluate information on technical developments in order to guide American research efforts. 4. To cooperate with other Government agencies active in guided missile development. 5. To cooperate in research with foreign representatives as may be consistent with military policy. 6. To invite attendance of persons interested in particular problems and projects with a view to coordination of effort. 52. The debate over guided missiles reveals the proliferation of technical committees advising the military and supplanting the NACA. A Committee on Guided Missiles was created in Jan. 1945 by the joint Committee on New Weapons and Equipment of the joint Chiefs of Staff, The joint Research and Development Board, which replaced the Office of Scientific Research and Development in 1946, had its own Committee on Guided Missiles; when the Research and Development Board replaced the JRDB under the terms of the National Security Act of 1947, it took over that committee as well as the Guided Missiles Committee. This was the year in which the NACA abolished its short lived Committee on Self Propelled Guided Missiles. 53. Joseph Adams Shortall, A New Dimension: Wallops Island Flight Test Range, the First Fifteen Years, NASA Reference Publication 1028 (Washington: NASA, 1978). 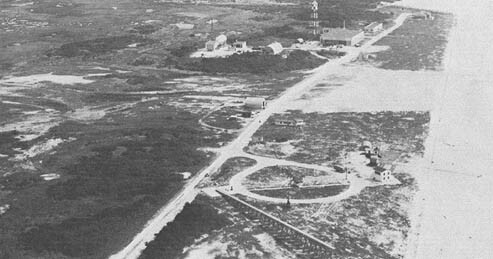 At first, only part of the land on Wallops Island was purchased; the rest was leased. In 1949 the NACA purchased the entire island. 54. Letter from Adm. Leslie C. Stevens, dated 10 Jan. 1947, quoted in minutes of Executive Committee meeting, 24 Jan. 1947, p. 11; Victory to Condon, 30 Jan. 1947; LeMay to Condon, 4 Mar. 1947. Because of the present unsettled conditions surrounding the Committee's research on nuclear energy, it was not considered advisable to let the report go out in its original form....It is requested that until further notice, no reference be made to nuclear energy in the laboratory's progress reports. One of the insights Dryden brought to the NACA was he perception that self serving could be self defeating. 57. See, for example, "Statement to Budget Officials by Dr. J.C. Hunsaker, Chairman, National Advisory Committee for Aeronautics," 13 Oct. 1948; AR 1948, p. 1; AR 1949, p. 1. 58. This copy of the estimates is in 64 A 518 (11), 1950.